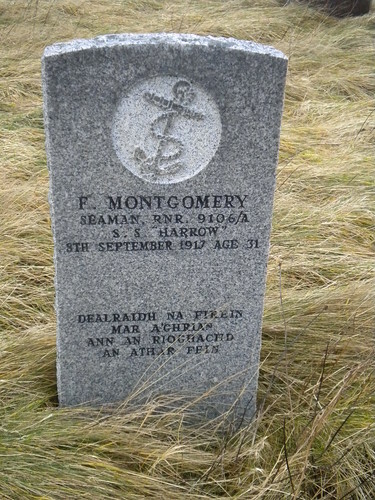 Seaman Finlay Montgomery RNR son of Mrs Montgomery, 1 Habost, Lochs, was killed at sea on 8 September. Finlay was a gunner on board a merchantman which was mined or torpedoed on the northeast of England. His body was recovered and taken to Whitby, from whence it was conveyed by rail and steamer to Stornoway. The burial took palce at Laxay Cemetery at 11.30 pm on the 15th September 1917. Deep sympathy is extended to the poor widow, his mother, in her sad bereavement, and it is to be feared the shock caused by the news has proved too much for her physical frame, as she is now seriously ill. The little village of Habost mourns over the death of Finlay, as he was undoubtedly very popular from his boyhood upwards. He was one of Mr John Smith's (now at Breasclet) best scholars, and after secury a bursary passed into the Nicolson Institute where he received his secondary education. He was trained for the teaching profession in Aberdeen, and held appointments at Melvig, Dundee and Auchiltibuie. He was headmaster of the last-named school, and was greatly loved by the people of the district, as was clearly manifested in their gift of a purse of sovereigns before he enlisted in the RNR. He was one of the best athletes of Lochs, as was his father before him, and the youths of the place will miss his happy smile in refereeing their favourite games, which he himself was the first to institute. For the last two years of his life, however, a marked change had come over him. In his early life he was an entusiast in physical things, but latterly he became an entusiast for the cause of Jesus Christ, and we believe it was his firm intention to enter the ministry of the Free Church. Alas, however, death claimed him at the early age of 31 years. We laid his mortal remains to rest in Laxay Cemetery at 11.30 on Saturday night, where he was buried by the light of the lantern. Here, like the hero of Corunna, we left him alone with his glory.